Create Background Part Accordingly with Two Blurbs Modules. Here we are with another post on “ Divi Café Demo ”. 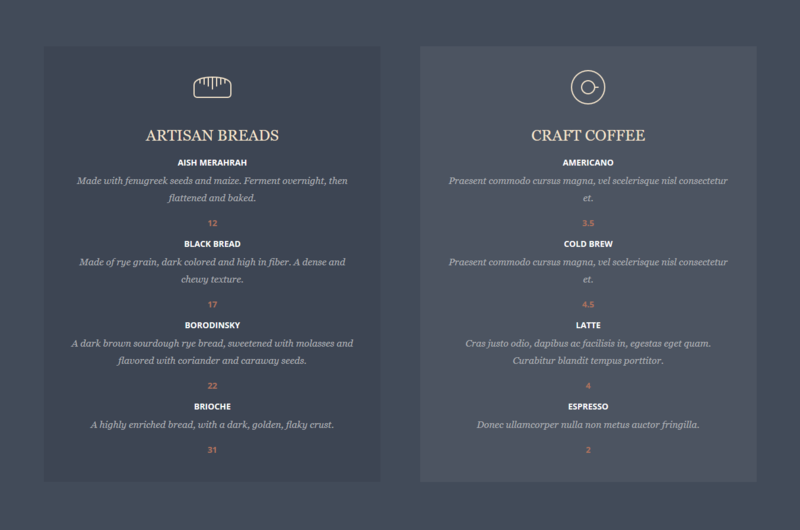 In this post we will design the dark background part with two blurbs modules. Add a standard section (½ + ½ columns). Go to Section Module Settings and set the background color accordingly (in demo #424b59 is used as bg color). Now go to Row Module Settings > Enable Make This Row Fullwidth > Save and Exit. Click on “Insert Module(s)” and add Blurb Module for both columns. Go to Blurb Module Settings and Insert URL for Icon on the Top (In Original Demo http://elegantthemes.com/preview/Divi/cafe/wp-content/uploads/2015/04/bread1.svg is used for top icon in first blurb module and http://elegantthemes.com/preview/Divi/cafe/wp-content/uploads/2015/04/coffee.svg in second). Select “Top” in “Image/Icon Placement” and Set other things according to need (Style your text through Text Editor or Advanced Design Settings). Now Go to Advanced Design Settings and set the background colour accordingly (in demo, colours used are #3d4553 and #4c5461 for first and second blurb module respectively). Scroll down a bit and set all custom padding 40px (i.e. top=right=left=bottom=40px) for both Blurb Modules (check the yellow highlighted part in the following image). In the next part of this series we will talk about the contact form module part, till then stay tuned! For any query or having any issue about Divi Café Demo, you comment below in comment box or create a new question. We feel pleasure in helping you and we will get back to you soon with a solution As soon as possible. Thank you for the great tutorial. I want to do my Navigation like the Divi Cafe Navigation, do you write a tutorial for it, too? We are still working on divi cafe demo, and you will find about Divi Cafe Navigation in upcoming articles.